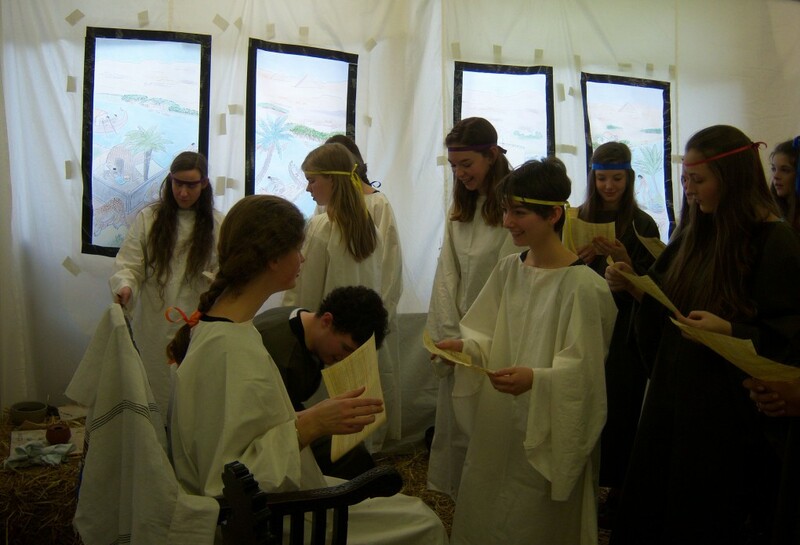 The Reading ancient schoolroom offers primary schools an innovative, accessible and enjoyable way to fulfill objectives in Key Stage 2 of the National Curriculum. Most obviously, it immerses them in the world of the Roman empire (History: p. 247 of the December 2014 National Curriculum framework document). But because the subject matter actually taught in the schoolroom is reading, writing, and English poetry (since these are the equivalents of the reading, writing, and Greek/Latin poetry that an ancient child would have learned), it also contributes to a variety of objectives in the English section of the National Curriculum. At Key Stage 2, these fall under the heading of reading comprehension, particularly discussing poetry, reading poetry aloud with prior preparation, and discussing the language of poetry (pp. 36-37). A variety of Key Stage 1 skills are also practised: reading aloud (pp. 21, 28), discussing material read (pp. 22, 29), and basic writing skills (pp. 23-25). We welcome Key Stage 1 children and have special materials for them. A lesson in ancient mathematics: Roman numerals and doing calculations on a counting board or abacus. The Roman numerals themselves feature in lower Key Stage 2 of the National Curriculum (pp. 126, 129), and the calculations can be at any level suitable to the children’s attainment, from basic addition to calculating compound interest (requested last year, and successfully carried out, by an enthusiastic 11-year-old). An introduction to Latin, using materials composed in the Roman empire to teach Latin as a foreign language. This addresses the foreign language requirement at Key Stage 2 of the National Curriculum (p. 253). A visit to Reading’s Ure Museum (conveniently located off the same corridor as the room used for the Ancient Schoolroom, so no travel is necessary), with the opportunity to handle real ancient artifacts under the supervision of specially-trained museum staff. The chance to sample Roman food (to be purchased separately; children are also welcome to bring their own lunch or to purchase modern food from the outlets on campus, and a place to eat will be provided). The schoolroom can accommodate a maximum of 20 pupils at a time, so groups larger than 20 need to take the full-day option. Such groups will be divided up and rotated among the different activities so that everyone has an opportunity to do everything over the course of the day. Free and reduced-cost places are available for a limited number of schools that cannot afford the fees, that can help us with publicity photographs, and/or whose teachers can supply detailed feedback after the event. Please get in touch if you are interested in such an arrangement. For dates, bookings, and contact information see 2018 Schoolroom. What is the Reading ancient schoolroom?